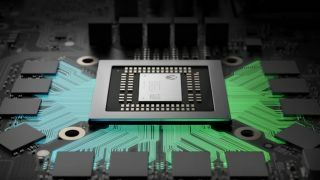 The Xbox Scarlett is already rumored to feature some cutting-edge silicon, but now we’re hearing reports this next-generation console will be the first to introduce separate CPU and GPU parts as well. Purported Xbox Scarlett specs have appeared on Reddit suggesting that Microsoft's next console will utilize an Arcturus 12 GPU featuring 64 ‘Arcturus Engines’ and a total of 4,096 GPU cores. That’s a beastly graphics chip compared to the 2,560 GPU cores found in the Scorpio graphics processor powering the Xbox One X. Furthermore, PCGamesN theorizes that this new Arcturus GPU will be made into a discrete graphics part due to the sheer size and complexity of the chip. It makes a lot of sense considering even AMD’s smallest 7nm GPU architecture, found in the Radeon VII, packs 3,840 stream processors into what is still a very sizable processor die. Add in the speculation that the next Xbox also may introduce 7nm Zen 2 CPU cores, and suddenly the creating a system-on-a-chip that incorporates both a 7nm processor and these high-end graphics becomes inordinately expensive and complex to manufacture. Of course, there’s a lot of speculation to read through here, and it's not hard to doctor a BIOS screen like this, especially when it’s just white text on a black background. So, we’re looking at this potential news with extreme trepidation until we hopefully hear more about the Xbox Scarlett or Xbox Two at E3 2019.